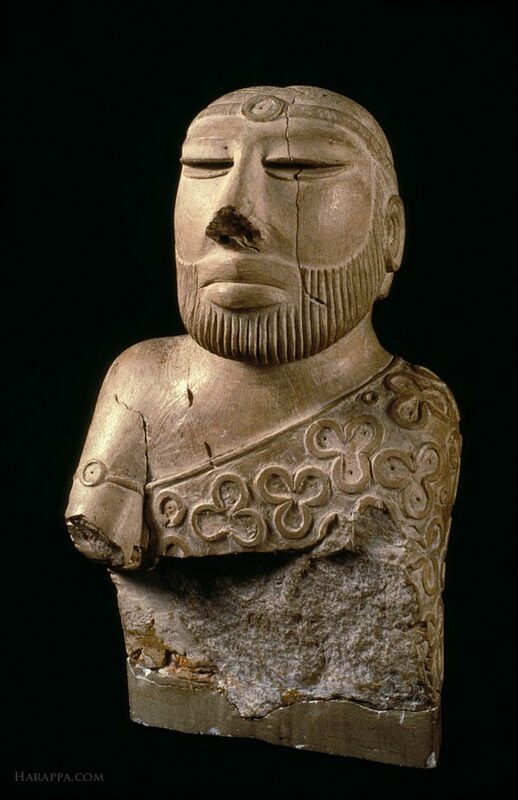 Seated male sculpture, or "Priest King" from Mohenjo-daro (41,42,43). Fillet or ribbon headband with circular inlay ornament on the forehead and similar but smaller ornament on the right upper arm. The two ends of the fillet fall along the back and though the hair is carefully combed towards the back of the head, no bun is present. The flat back of the head may have held a separately carved bun as is traditional on the other seated figures, or it could have held a more elaborate horn and plumed headdress. Two holes beneath the highly stylized ears suggest that a necklace or other head ornament was attached to the sculpture. The left shoulder is covered with a cloak decorated with trefoil, double circle and single circle designs that were originally filled with red pigment. Drill holes in the center of each circle indicate they were made with a specialized drill and then touched up with a chisel. Eyes are deeply incised and may have held inlay. The upper lip is shaved and a short combed beard frames the face. The large crack in the face is the result of weathering or it may be due to original firing of this object.